Rediff.com » Movies » Tweet diary: Guess what? SRK is back! Tweet diary: Guess what? SRK is back! The promotion for Ra.One has already started and it couldn't have been a better time for Shah Rukh Khan than now to return on twitter. It's a special day for SRK not because the first teaser for Ra.One airs today but also, its his daughter's first day of school. 'will hit the sack now...its late. daughters first day of school tomorrow...sixth standard..so have to wake up with her to give her a big hug. love you all and will connect tomorrow in the day. have a restful nite,' he added later. What do you think of the trailer? Hit or another Raavan? Abhishek Bachchan also shared the promo of his latest Game. The movie is described as stylish action thriller by makers of the film. Abhishek plays a drug lord, Shahana Goswami portrays Tisha Khanna, a journalist, Boman Irani a politician, Jimmy Shergill a movie star and Kangana Ranaut plays a police officer. Whereas the film is directed by Abhinay Deo and produced by Farhan Akhtar and Ritesh Sidhwani. Preity Zinta shot a special episode with the team of Dum Maaro Dum for her TV show Guinness World Records - Ab India Todega. 'Back home after shooting 4 Guiness World Records with AB and the team of Dum Maro Dum ! Phew ! Wish them all the best 4 the film :-) Ting ! It was so nice seeing AB after so long ! Am so tired that i will have 2 literally crawl into bed... So good night & sweet dreams tweeple !' she tweeted. 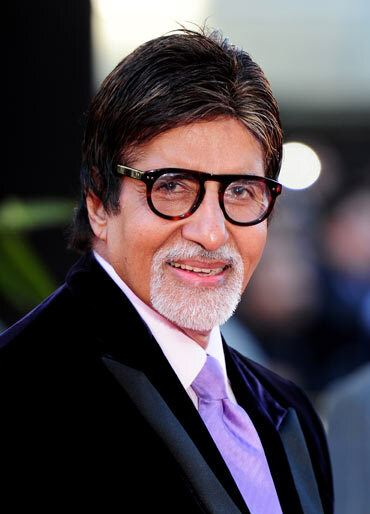 Amitabh Bachchan cleared the air regarding his presence at the ICC Cricket World Cup. 'Many media asking if I have booked tickets for the World Cup final .. not true .. news is false !!' he tweeted. Meanwhile, he also updated about his shoot with Jaya. 'Back from Tanishq shoot with Jaya ... loved it .. relaxed, well controlled atmosphere ... wife seemed happy and comfortable .. !! Must get her in front of the cameras with me ..she is such a natural ! More films perhaps with her in roles commensurate with our age. Also TwFmXt asking for stills from the shoot today with Jaya and Tanishq ... um !! client has stopped me from publishing it ..' he added later.